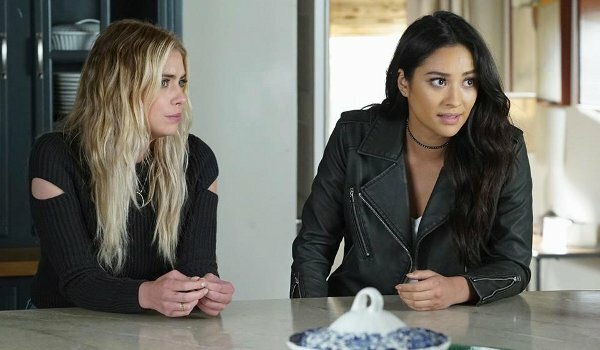 The series' final mid-season finale may not deliver the identity of A.D. (although we can cross two more possibilities off the list), but it does offer its share of moments and secrets revealed heading into the hiatus before Pretty Little Liars returns for its final ten episodes next spring. Hanna's (Ashley Benson) disappearance forces the Liars to get the police involved and let the authorities know about Noel Kahn's (Brant Daugherty) connection to the Doll House and A. As everyone believes Kahn has kidnapped Hanna the reverse is actually true, although the outcome will be far different than the Liar planned. Kahn's kidnapping may not get Hanna the answers she wants but it will put in motion a series of tragedies to end the mid-season finale including Spencer (Troian Bellisario) being shot and learning about her connection to Mary Drake (Andrea Parker). Things aren't any better for her former boyfriend whose attempt to leave town ends in disaster. As for Emily (Shay Mitchell), her attempt to offer comfort to one friend only causes animosity in another. And Aria's (Lucy Hale) worst fears come true when Ezra's (Ian Harding) other fiance turns out to be very much alive. The series events in the episode's closing scene will cross off both Noel and Jenna Marshall (Tammin Sursok) as possibilities for A.D. Noel's gruesome end may end one threat against the Liars but their main adversary remains. And the discovery of Mary Drake's second child apparently won't help solve the mystery. With only 10 episodes when the show returns in April who will be revealed as A.D., and, before that happens, what plans do they have for the Liars?